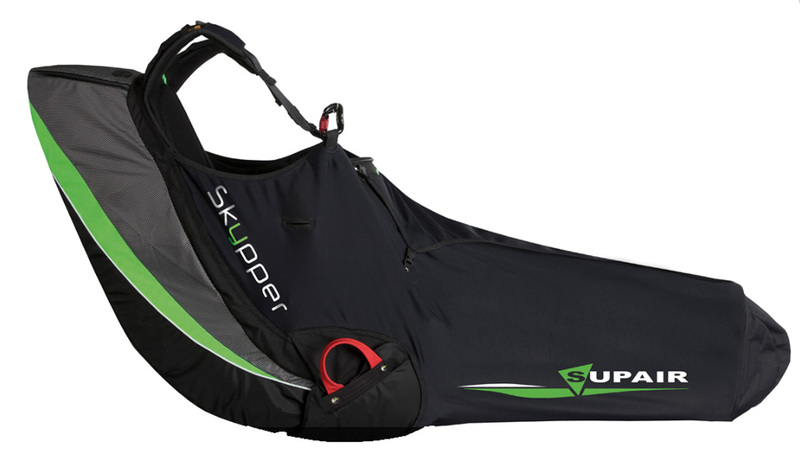 A technically advanced light design harness, aiming at XC and competition pilots; the SKYPPER is outfitted with a pod in addition to a standard ergonomically fitting efficient top to bottom back protector. The adjustments are particularly easy to deal with. The SKYPPER is precise and stable when steering via seat-plate control, and provides accurate feedback from the wing. The reserve parachute pocket located under and beyond the seating area does not impede with the BumpAir's effectiveness to operate while keeping the reserve parachute handle fully accessible. Carbon fiber seat-plate and foot-plate, this harness is obviously targeting XC and competition pilots wanting a light and compact pod harness. Equipped with a built-in Speedbag (pod), an integrated detachable instrument / cockpit, a Bumpair 15 cm back protector, a new seat and back support, the SKYPPER will surprise you by its comfort and abilities in all flying conditions. A cleverly designed Speedbag enables the pilot to easily enter and exit the pod; the integrated cockpit is judiciously located, enabling for a direct visual contact of the instrument panel. The SKYPPER is equipped with a self-adjustable double-stage speedbar in addition to the pulleys with interchangeable bearings (self-locking pulleys optional). An easily accessible ballast pocket (5L) is located beneath the seat. Click the button below to add the SupAir Skypper to your wish list.